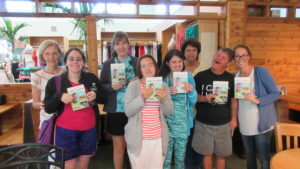 Next Chapter Book Club offers community-based book clubs for adolescents and adults with Down syndrome, autism, cerebral palsy and other intellectual and developmental disabilities. The participants (including some who cannot read) love books for the same reasons most people do. They enjoy being transported to different worlds where they meet interesting characters and learn about exciting new things. Taking that journey with a group of friends makes it even more delightful and fun. STARability is proud to be the only affiliate of the Next Chapter Book Club in Southwest Florida for people with intellectual disabilities. For more information on volunteering or participating in the STARability Next Chapter Book Club, contact Susan at 239-594-9007 or Susan@starability.org.